We accept orders 24 hours daily. 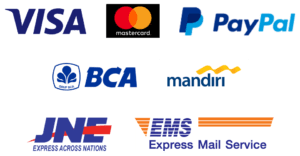 Orders made at www.preghiero.com will be processed and shipped to carrier within 1–2 business days, package will arrive at destination 1-3 Business days later for Jakarta, Bogor, Depok, Tangerang, Bekasi, and 3-7 Business Days later for other regions. All orders placed on Saturday and Sunday (including national holiday) will be processed on the next business day after receipt of payment. Packages are shipped via Carrier with tracking and drop-off without signature. If you prefer delivery by Carrier Extra with required signature, an additional cost will be applied, so please contact us before choosing this method. Express delivery service only available for cities with airport, please kindly take note on this as we do not process any claim or refund for careless action upon this term. Please note Rollover Reaction Cosmetics do not responsible for any miss-placed package caused by incorrect given address, please make sure your order’s information before shipment. For shipping address to office building, kindly consider with our shipping duration and policy so it will not arrive on Saturday or Sunday. We do not responsible for any claim to these matters.